The vineyards have an average area around 2500 m2, normally are non-wired, and present white and red varieties in the adequate proportion to obtain the Medieval wine. Only two grape varieties are used to produce this wine: Fernão Pires for the white must and Trincadeira for the red must. These vineyards have high density of grapevines per hectare, more than 4000, being possible to attain 10000 plants per hectare. This option has the purpose of obtaining grapes of better quality rather than to obtain a greater production. Most ancient vineyards are bordered with olive trees and fruit trees such as apple-trees, pear-trees and peach-trees, and, sometimes, it is even possible to find these trees spread all over the vineyards. Following a trellis system named “taça” with three arms spread apart, the grapevines are pruned leaving short spurs, and, less frequently, fruiting "canes". In all their characteristics they look like medieval vineyards. 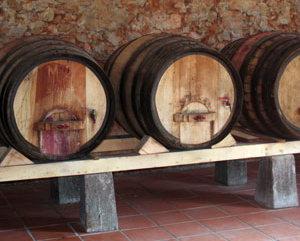 In the region of Ourém, the Medieval wine is currently produced in small and characteristic wine cellars (modest, dark and fresh but not humid, normally situated under the inhabited floor of the wine producer‘s house). The harvest has to be manual and the white and red grapes are transported to the wine cellar in separated containers. The white grapes are pressed and the resulting must is used to fill wooden barrels up to 80% of their capacity, where the fermentation will start. Subsequently, the red grapes are distemmed with a “ciranda” directly to wooden vats called “dornas” (less frequently in stone “lagares”) and the fermentation lasts for four to ten days with the maceration of the skins of the grapes. At least twice a day the cap is sunk with a wooden tool called “rodo” in order to obtain a red must with the necessary quality parameters. Almost at the end of the fermentations of both musts, the red one (20%), not pressed and with the skins, is poured directly into the wooden barrels where the white must (80%) is fermenting in order to fill up its remaining free capacity and to develop a joint final fermentation of both musts. When this final joint fermentation is complete, the cap will sink to the bottom of the barrel, helping filtering naturally the wine. Although white grapes are predominant, the Medieval wine is “red”. A soft but yet strong wine with a full, sharp and complex mouth is obtained. It is a unique nectar with white wine aromas, that change according to the grapes maturity, but also with red wine aromas, usually mulberries, raspberries and strawberries. This wine goes along with the rich gastronomy of the region as well as with several typical Portuguese dishes; in particular dishes prepared with lots of olive oil like the grilled codfish with “chícharos” (very similar to chick-peas) and “migas” (very thin sliced cabbage leaves with rice, bread and beans), a tradition in our region. The current production and availability of this wine still nowadays can only be explained by its remarkable qualities besides the perfect adaptation of its method of production to the “terroir” of Ourém. Since 2005, these ancestral practices, both viticultural and oenological, are regulated by law (Portaria 167/2005), preventing them from disappearing thus protecting a very important heritage from the Cistercian monks, which certainly are worth being considered as a worldwide value to be preserved.